Distribution map of the cactus wren. The cactus wren is the largest North American wren, at 18–23 cm (7.1–9.1 in) long. Unlike the smaller wrens, the cactus wren is easily seen. It has the loud voice characteristic of wrens. The cactus wren is much less shy than most of the family. Its marked white eyestripe, brown head, barred wings and tail, and spotted tail feathers make it easy to identify. Like most birds in its genus, it has a slightly curved bill. There is little sexual dimorphism. 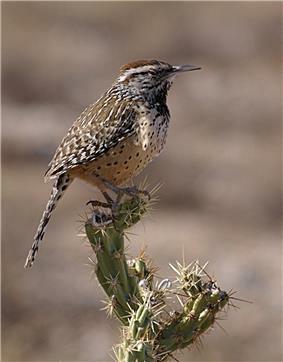 The cactus wren primarily eats insects, including ants, beetles, grasshoppers, and wasps. Occasionally, it will take seeds, fruits, small reptiles and frogs. 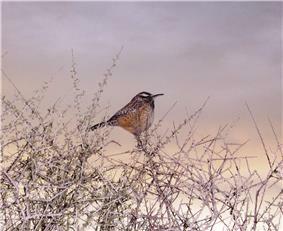 Foraging begins late in the morning and is versatile; the cactus wren will search under leaves and ground litter and overturn objects in search of insects, as well as feeding in the foliage and branches of larger vegetation. Increasing temperatures cause a shift in foraging behavior to shady and cooler microclimates, and activity slows during hot afternoon temperatures. Almost all water is obtained from food, and free-standing water is rarely used even when found (Udvardy 1994; Ricklefs 1968; McCarthey 2000).